Leather may be used to create handbags. The handbag or purse is a helpful and fashionable accessory, primarily carried by women. Handbags hold things like wallets, though in British English, the word purse may better describe a wallet than it does a handbag. They can also hold keys, cellphones, tissues, business cards, and many other small items. Sometimes these useful carrying devices get cluttered, especially when they’re large and used to store lots of things. Early handbags weren’t carried in the hand, but instead were worn around the waist, and there are references to these pouches in Ancient Egypt. In about the 1400s in Europe, both genders wore small carrying bags, and like many modern ones, they could be elaborately decorated. The term handbag didn’t arise until the early 20th century, and by then generally only women carried these bags. There are many styles of handbags. These include small evening bags, or clutches, which may or may not have handles. Most handbags are worn over the shoulder, and some of these may have one or two straps. Additionally, those with short straps that can't be worn over the shoulder are called satchels. The actual bag portion of a totes are typically larger in size and typically have two long straps. Slings have a single strap that is easy to put over the shoulder. Strap length doesn’t always dictate type of bag, however, because many purses have adjustable or removable straps. Size of handbags really varies from the small impractical clutches to extremely large purses. Shapes vary too; oblongs, circular, U-shapes, and many others go in and out of style depending on trends. More expensive purses tend to use quality leather, but less expensive ones may be made of different fabrics, imitation leather, or scrap leather. Another feature that makes many handbags different is number of internal compartments. A handbag can have one single compartment with perhaps an interior pocket for keeping a cellphone. Other purses have several pockets or separators, which can help keep things organized. Historically, women are the traditional carriers of handbags. There have been some handbags designed for men in the late 20th and early 21st century. Sometimes these are larger, messenger bag types, and they may be jokingly referred to as murses or man-bags. As a fashion trend, they’ve not been hugely popular, though there was a noted episode of Friends airing in 1999, where the character Joey became immensely attached to his “man-bag.” The episode reflects the idea that for many men, handbags are still associated with women’s accessories. What Are the Different Types of Ruffle Purses? 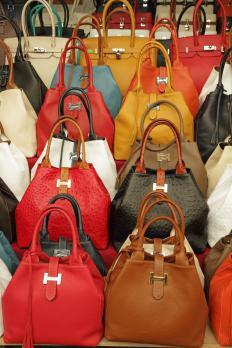 How Do I Choose the Best Wholesale Purses? What is a Birkin Bag?